Gelato literally translates to “frozen,” but according to “On Food and Cooking,” the word can be used to describe a variety of frozen confections in Italy. This style of custard ice-cream traditionally has a high content of butterfat and egg yolks, which makes for a deliciously rich, creamy dessert. While on my one-month long study abroad in Florence, Italy, I was guilty of enjoying this mouth-watering treat after both lunch and dinner on some (most) days. The flavors were unbelievable! Some of my favorites were pear, hazelnut, and Parmigiano-Reggiano. Yes, you heard me, cheese! This unusual ingredient provided an addicting sweet and savory flavor. Also during my time in Italy, I was able to tour Carapina, a famous Florence-based gelato shop (http://carapina.it/). 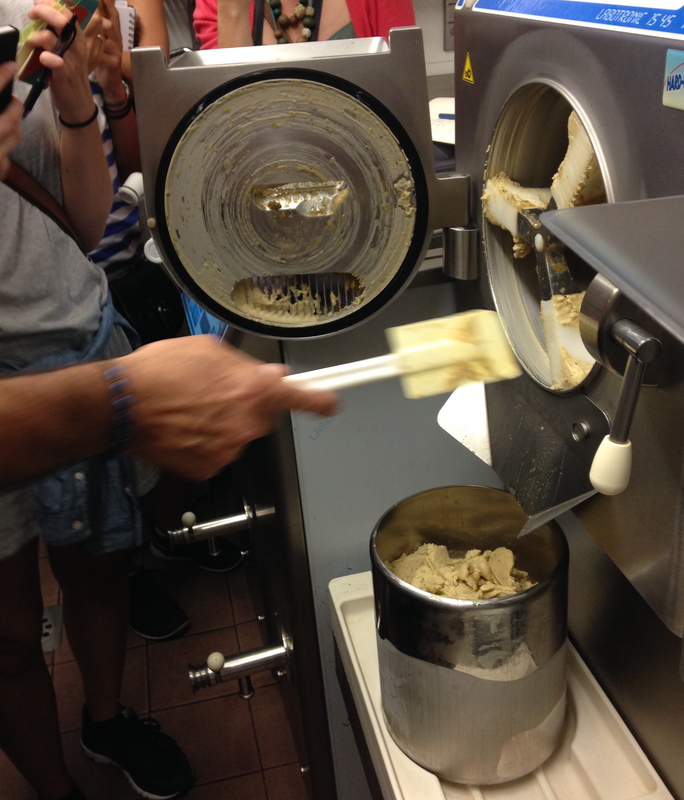 During this tour I learned about the gelato making process and was able to witness the making of grape gelato from start to finish. All fruit gelati (plural for gelato) are actually sorbet because the only ingredients used are fruit, water, and sugar. Simple! The grape gelato tasted exactly like biting into a juicy, sweet green grape. Ever since then I have been craving gelato! As fate may have it, I stumbled across a special Mediterranean edition of Bon Appetit from 2002. Of course I flipped to the desserts and, lo and behold, gelato recipes! The chocolate-almond gelato caught my eye first and I had to have it. The recipe turned out to be fairly simple to make! This particular recipe is from the city of Sicily, where gelato typically does not contain any cream or eggs, therefore is lower in fat and saturated fat. What’s not to love!? 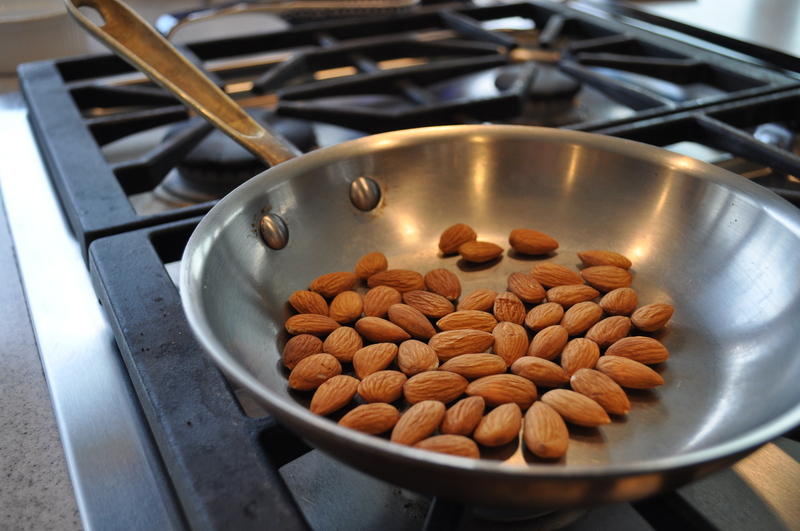 Instead of buying slivered almonds, I used whole almonds since you process them anyway. Toast, stirring constantly, over medium heat, until they start to brown and smell like popcorn. 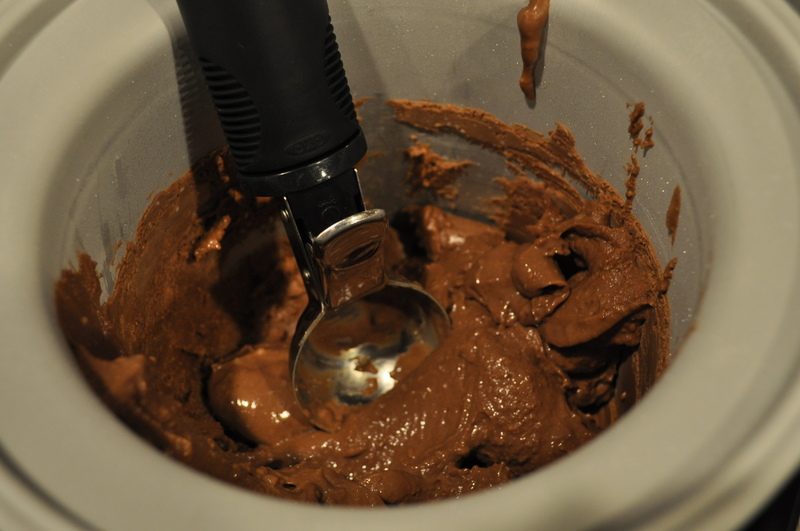 Hint: whisk the sugar and cornstarch together before adding to the food processor to help prevent lumps in your gelato. 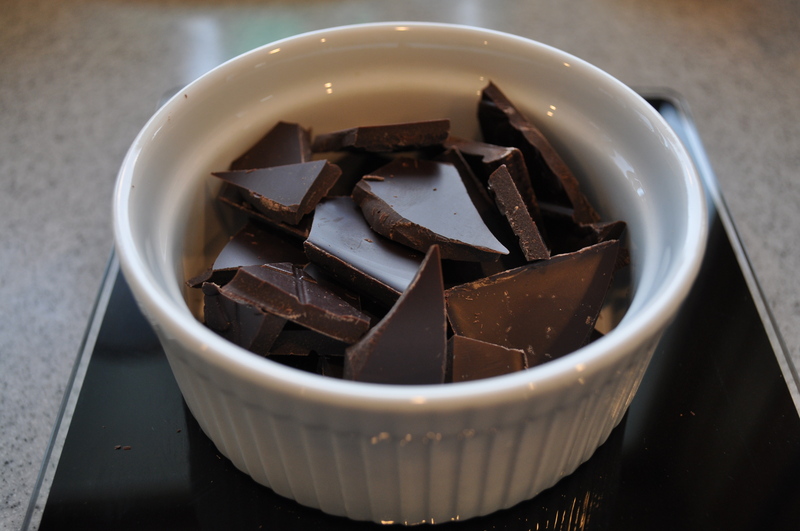 I used 72% dark chocolate. Keep whisking to prevent the milk from scalding! It took some strong will-power not to eat the whole batch before sticking it in the fridge! It tastes like the most delicious pudding at this point. 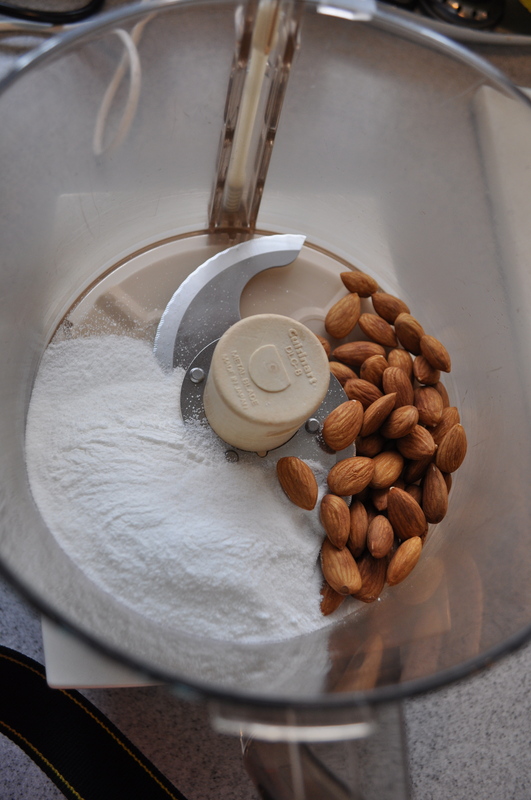 Combine almonds, sugar, cornstarch and salt in processor; blend until nuts are finely ground. Transfer nut mixture to heavy medium saucepan. Gradually whisk in milk. 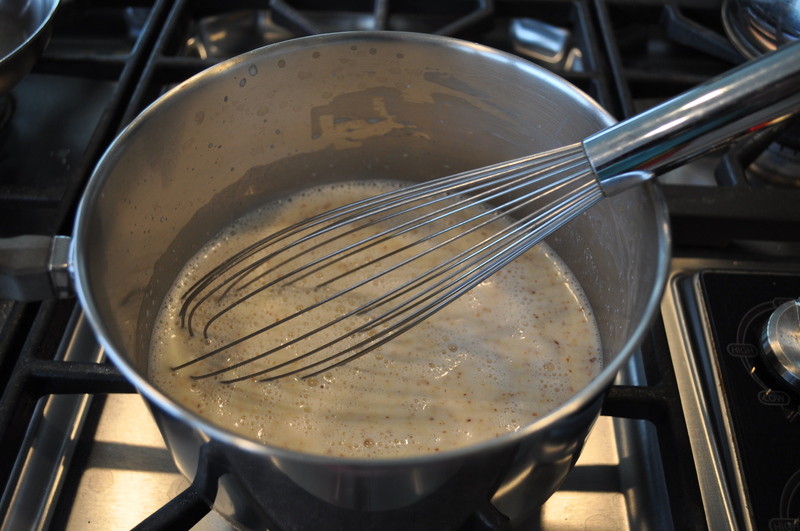 Whisk over medium heat until mixture thickens and boils, about 5 minutes. Remove from heat. 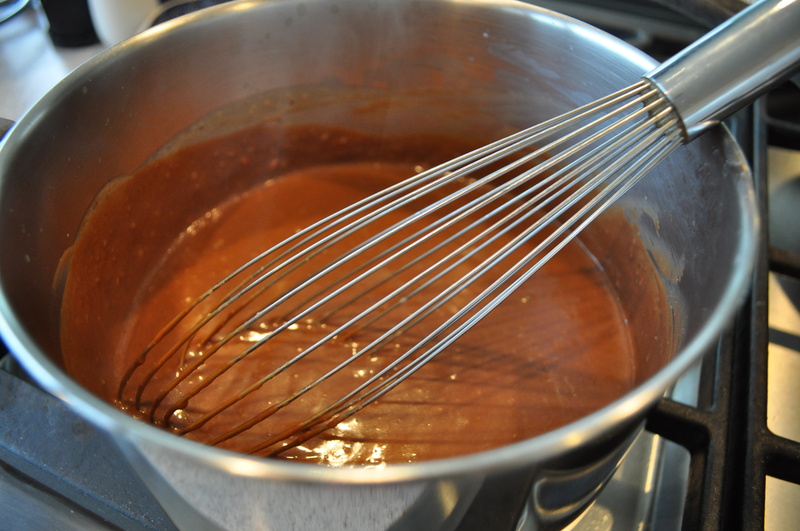 Add chocolate and whisk until melted. Mix in almond extract. Press plastic wrap onto surface of gelato base. Refrigerate until cold, about 3 hours. Transfer gelato base to ice cream maker and process according to manufacturer’s instructions. Transfer gelato to container; cover and freeze. The finished product! Not as pretty as the magazine picture, but boy was it tasty! I think Italian gelato is the best ice cream in the world. I can’t wait to get back there for more. “Heavenly” is more like it! I could have eaten the whole batch! Now to find an ice cream maker!!! Looks so good! A great post! I really can’t wait to buy an ice cream making either.